Clemens Westerhof has told BBC Sport he can "make Nigeria great again" if he is appointed coach for a second time. Nigeria, who have failed to qualify for the 2017 Africa Cup of Nations, are seeking a permanent coach following Sunday Oliseh's resignation in March. Westerhof coached Nigeria for five years from 1989, winning the 1994 Nations Cup and leading them to their first World Cup in the same year. "I know what Nigeria lacks and I can make them great again," he said. "Nigeria need a strong person with the required experience to bring them out of the negative position they are in right now. "Nigeria is a big country and the national team should be in the top 10 in Fifa's world rankings, not the 67th position they currently occupy. "For 22 years I have watched everything I built slowly collapse and all I need is a chance to fix the national team again. "With due respect to Sunday Oliseh, he was a good player but the job of managing Nigeria is not for an inexperienced person and that is the reason things never worked out. "I know what Nigeria lacks and need to be respected in the world again. " The Super Eagles won the 2013 Nations Cup but have now failed to qualify for two consecutive tournaments. 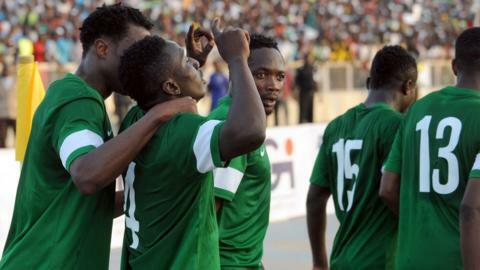 Nigeria Football Federation (NFF) president Amaju Pinnick has publicly stated he believes only a foreign coach can revive the fortunes of the three-time African champions. Dutchman Westerhof feels he is the right man for the job and insists he has unfinished business with the Super Eagles. "I left Nigeria as number five in the world and now I want to do it again, this is my second country and what I accomplished then is possible again," he said. "Just give me the Super Eagles again and watch what we can all achieve together." Westerhof, who is the longest-serving manager in the history of Nigerian football, has also coached in the Netherlands, South Africa, Egypt and Zimbabwe.